Our logo in all its sleekness. Get One Button game and movie now! LC racks up four years at the 48 hour game comp! Welcome to the Lurker's Craft website. We are an Australian-based independent computer games developer, formed in 2006 by QUT graduates and members of the Brisbane chapter of the International Game Developers' Association. Lurker's Craft has been awarded twice in the '48 hour game competition' held at the QUT Kelvin Grove campus. Download our creations from the games page on this site, and then see the competition website for details about what we're up against each year. Feel free to contact us if you'd like to get involved. Created during the 2010 48-hour game making competition. The words for this year's challenge were Dinosaur, Bar, and Revenge. Sweet Revenge is a two-player, competitive/co-operative platformer. 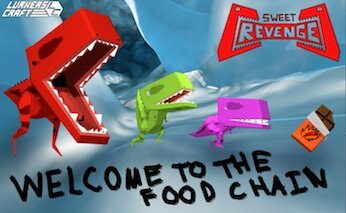 Players must control their dinosaurs through various levels while on a mission to recover their stolen Chilli Chocolate bars. Take note, however, that although dinosaurs love chilli-flavoured chocolate, it takes its own flavour of revenge shortly afterwards!